While the the Teicher Organization’s proposal may have been larger in size, its other details are similar to the proposed Kingstonian Project. Both were categorized as Type 1 actions with a coordinated review process. 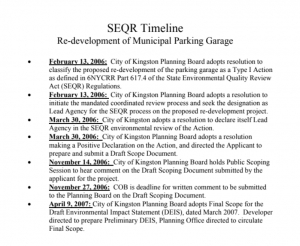 For both, the Kingston Planning Board was/is the lead agency. But will their determinations be the same? Looking back, Teicher’s project received a positive declaration (pos dec), that was followed by a public scoping process and a draft environmental impact statement (DEIS). At that time, scoping was not mandatory (as of January 1, 2019, a pos dec automatically triggers a public scoping process). Based on the SEQR timeline for the Teicher project, the final scope was complete after only five months of effort by the Planning Board. That’s not a bad turnaround. The developer was then directed to prepare a preliminary DEIS, which doesn’t appear to have occurred. For the Kingstonian, a determination has not yet been made. We are expecting a decision by the Planning Board in the coming days, weeks, or months. Though the applicant’s team and supporters claim on record that a pos dec will “kill” the project. The Teicher proposal is an excellent point of reference because it shows us a similar development in the same location as the Kingstonian that received a pos dec determination in SEQR. 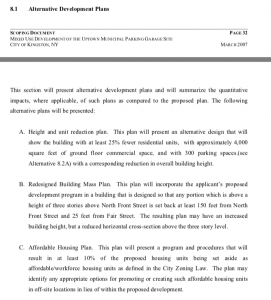 Of note, when the Planning Board submitted its final scope and direction to Teicher to create a DEIS, the developer chose not to proceed. Maybe it was because what they wanted to build was not a good fit for the location, and that mitigating its impacts was not an option for them. In this instance, SEQR provided close scrutiny. Outlining potential environmental, social and economic impacts before something is built is in most everyone’s best interest. It is unfair to characterize a pos dec as a project killer. What is a Positive Declaration? A positive declaration, or “pos dec,” is a determination by the lead agency that an action (the project) may result in one or more significant environmental impacts and so will require the preparation of an Environmental Impact Statement (EIS) before agency decisions may be made regarding the action. What is a Negative Declaration? A negative declaration, or “neg dec,” is a determination by the lead agency that an action will not result in a significant adverse environmental impact and consequently no EIS will be prepared. permit inclusion of relevant, substantive public issues in the final written scope. Public involvement reduces the likelihood that unaddressed issues will arise during public review of the draft EIS. From the public’s perspective, scoping is important because it offers an opportunity to ensure the DEIS is as comprehensive as possible to minimize the project’s environmental impact on the community. It also increases the likelihood the project will be consistent with community values. The final scoping document for the Teicher Organization project is an important find as it shows the existing setting, potential impacts and mitigation measures of the site and the project. It also provides evidence that a large development in that location most likely merits a pos dec in SEQR. For however long the conversations about the Kingstonian have been going on, SEQR is just now getting underway. Many, if not most, members of our community are learning about this project and its plans for the first time. It makes sense that if we are expected to welcome a project of its size and scope in the nationally significant Stockade Historic District, then it must be done properly to assure that it adds to its beauty and character and does not create a costly and unaccounted burden on our existing infrastructure. A thorough and inclusive SEQR process can help to do that.